Silences – loudlatinlaughing – Euge! Euge! I was foolish to think I could read this book curled in an armchair instead of at a desk with laptop nearby. 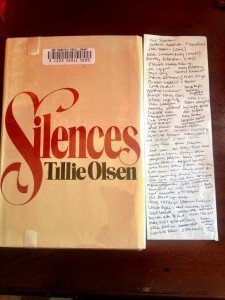 Sitting comfortably in my chair, I scribbled notes of the names of writers I hadn’t heard of and then decided to create a labor of love and list all the women writers referenced in the book (199 by my perhaps flawed count). For this, I needed laptop close by, so it was read, add to spreadsheet, then back to reading. Disjointed, yes, but so is the work itself. Its structure is centered around a 1962 talk, Silences in Literature, the topic taken up again in a 1971 talk, One Out of Twelve: Writers Who Are Women in Our Century. The bulk of Part 1 is then devoted to a deep dive into the life and writing of Rebecca Harding Davis, the completely ignored writer whose work has been revived with the help of Olsen. Part 2 encircles Part 1 by bolstering the argument with supporting quotations from varied writers. Part 3 is a mishmash of excerpts from Rebecca Harding Davis, Baudelaire, and an essay on the creative potential wasted by first generation who must struggle. Bent (far more common than we assume), circumstances, time, development of craft- but what beyond that: how much conviction as to the importance of what one has to say, one’s right to say it. And the will, the measureless store of belief in oneself to be able to come to, cleave to, find the form for one’s own life comprehensions. Difficult for any male not born into a class that breeds such confidence. Almost impossible for a girl, a woman. The leeching of belief, of will, the damaging of capacity begin so early. Sparse indeed is the literature on the way of denial to small girl children of the development of their endowment as born human: active, vigorous bodies; exercise of the power to do, to make, to investigate, to invent, to conquer obstacles, to resist violations of the self; to think create, choose; to attain community, confidence in self. Little has been written on the harms of instilling constant concern with appearance; the need to please, to support; the training in acceptance, deferring… But it is there if one knows how to read for it, and indelibly there in the resulting damage. One–out of twelve. I am suffering from a frightful malady of the mind… a kind of erosion. My thoughts evade me in every way possible. There is something that is destroying my thinking, something that does not prevent me from being what I might be, but which leaves me in abeyance; a something furtive which takes away the words I have found, which step by step destroys in its substance my thinking as it evolves, which diminishes my intensity, which takes away from me even the memory of the devices and figures of speech by which one expresses oneself. What will restore me to the concentration of my forces, the cohesion that my mind lacks, the constancy of its tension, the consistency of its own substance? If an artist does not spring to her work as a soldier to the breach, if once within the crater she does not labor as a miner buried in the earth, if she contemplates her difficulties instead of conquering them one by one, the work remains unachieved, production becomes impossible, and the artist assists the suicide of her own talent… The solution of the problem can be found only through incessant and sustained work… true artists, true poets, generate and give birth today, tomorrow, ever. From this habit of labor results a ceaseless comprehension of difficulties which keep them in communion with the muse and its creative forces. Pococurantism. I looked it up. It means caring little, being indifferent, nonchalant. Also learned about the 1974 National Book Awards where badass Adrienne Rich won, yet “refused the terms of patriarchal competition,” rejecting the award as an individual, but accepting it in the name of all women in a statement written with Audre Lord and Alice Walker. And my to-read list grows ever longer.